Hello and happy fall my friends. During this time of year, I get so inspired to decorate around my house! I swear, if you already follow me on Instagram @chichomelife then you’ve already seen an explosion of pumpkins everywhere on my feed! And if you’ve read my most recent post, “5 Simple ways to add fall decor to your living from” then you know my decor game is on! Outside of decorating, I get inspired to bake. I hate to admit it, but I have a terrible sweet tooth. So, when this time of year comes around, I totally look forward to the yummy aromas and tastes of apple pies, pumpkin bread and all sorts of things. How about you? Last year, I found this yummy recipe, Pumpkin Spice cupcakes on Pinterest and I was ready to go on faith and give this recipe a try! Have you ever found yourself scrolling through cookbooks or hundreds of boards on Pinterest looking for a great pumpkin spice cupcake recipe to try? But, you were leery of trying it in fear of the recipe would be a disaster? That’s me all the time, however, when I tried this recipe I was in heaven. This recipe was very easy to follow and needless to say, the cupcakes were delicious!! Most importantly my hubby and teenage son loved them. The rich pumpkin spice flavor was delightful, and my home was filled with the scent of pumpkin spice. Did I mention that the light and delicate cream cheese frosting tasted AMAZING!! Yes, amazing!! As a result, I had to bake these yummy treats again for my family and share this mouth-watering treat with you all too! 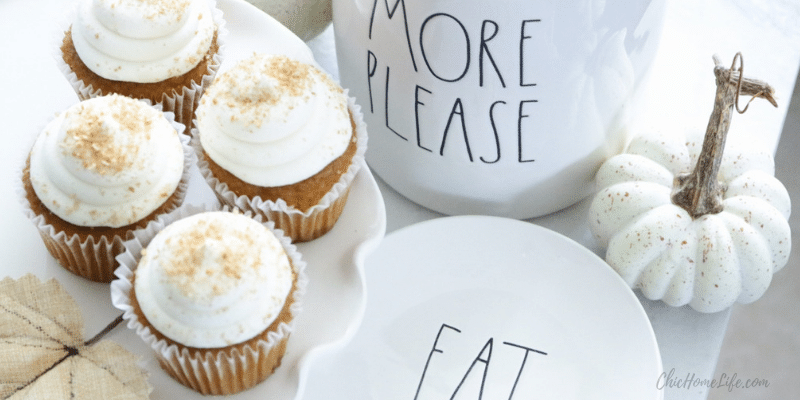 If you love pumpkin spice and cupcakes, then this recipe is for you!! Below you will find the recipe card to get started. In the meantime, what is your favorite fall dessert? Let me know by leaving your comment below. Until then, happy baking!! Preheat your oven to 350 degrees Fahrenheit and prepare one 12-cup muffin tin with paper liners. Combine the pumpkin puree, eggs, sugar and oil in a large bowl and whisk everything together until combined smoothly. In a separate bowl whisk together all the dry ingredients (flour, baking soda, spices and salt) and then dump the dry ingredients into the wet ingredients. Using a rubber spatula or a wooden spoon, combine the wet and dry ingredients until the flour disappears. Spoon the mixture evenly into the 12 muffin tin line with paper liners until the batter is evenly distributed. Bale the cupcakes at 350 degrees for about 20 minutes, or until a toothpick inserted into the middle of one of the cupcakes comes out clean. When they're done, the pumpkin spice cupcakes will be puffy and gold brown. Remove the cupcakes from the time and place them on a wire rack to cool completely while you prepare the frosting. Once the cupcakes has cooled to room temperature, pipe the frosting on in a circular motion on top of each delicious cupcake using whatever tip you wish. Sprinkle your favorite topping. You can use sugar, crush pumpkin spice cookie and graham cracker crust too!! Whoa! You had me at pumpkin purée and cream cheese 😂 This sounds amazing and I will definitely put them on my list to bake when MY sweet tooth kicks in! Thanks for sharing! I know… I am such an enabler with the treats!! I definitely would recommend to eat them on a treat day. I believe each cupcake is about 300 calories each, Yikes!! Love!! I need to get baking for the fall! I am so happy that you love this and it has inspired you to get started with baking!! You must let me know what you bake! I love trying new recipes!! These look so yummy!!!! Pumpkin is definitely one of my favorite flavors. I can’t wait to give this a try!! Thank you for stopping by! If you try this let me know what you think. I would love to know!! Until then, have a great week!! Thank you so much for visiting!! I hope you give the recipe a try! !